Central Mast Height: 19 Mtr. Tie Member Length: 29 Mtr. Being one of the renowned firms in the industry, we are decidedly involved in providing a high-quality array of Derrick Crane Machine. 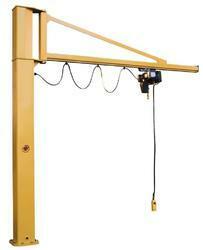 Derrick crane is a combination of the derrick and the crane, capable for hoisting and swinging the load horizontally. 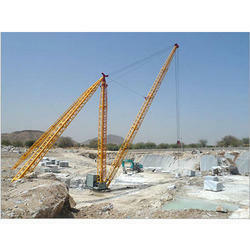 Hydraulic derrick crane are the most suitable cranes for mining and stone work industries. Lifting Speed: 1 Mtr/min. to 9 Mtr/min. It used for lift mould from injection moulding machine. With a firm commitment to quality, our organization is involved in offering a wide ambit of Derrick Crane.